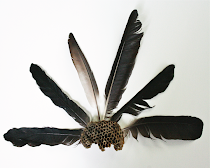 The Plumed Nest: Pallets, Who Knew? I'm sure, like me, you see pallets almost on a daily basis: the back of trucks, grocery stores and other places such as these. Sometime I see a sad little pile of discarded ones and I often think, I bet that could be used to make something. But my creative brain has never gone beyond the fact that there was a possibility in these little wooden structures - but obviously others have thought of many creative ideas to reuse them. These photos are just a mere sample. I have also seen coffee tables, chandeliers, and bike racks to name a few more. I have to admit I love things that can be upcycled and repurposed. But I also have to admit that while I love all of these pallets-turned-furniture, the germaphobe in me would be a little nervous in taking on pallet projects, especially after reading this. But I do really like the shelving and the vertical garden which would be so great for someone with limited garden space and it's just really cute. I just probably wouldn't grow anything edible in it! What do you think about all this pallet goodness? My mom who is always, always ahead of her time (she was into yoga, among other things, well before it was cool) has long wanted a pallet bed. I think she'd have it made though, rather than pull one off the back of a truck! i DO love the beds though I am afraid I would be destined that it would forever look like I just put paletts under my bed. my bedroom is the place i really fail in the decorating department. 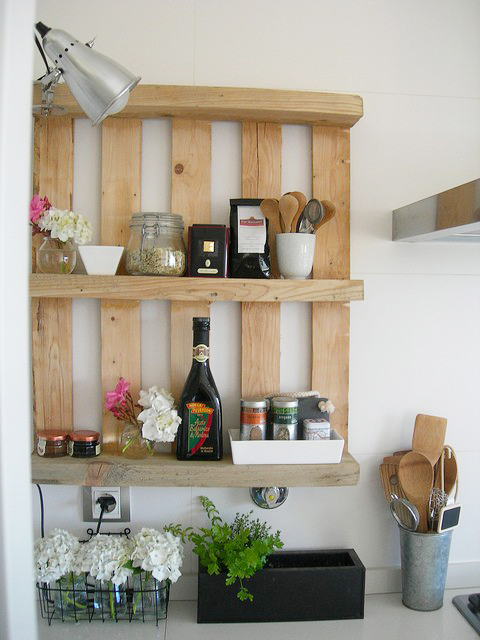 Oh Christine I LOVE all the repurposed pallet uses!! I am SO loving that spice rack though!! The bed idea would make cute toddler to kid beds I think!! 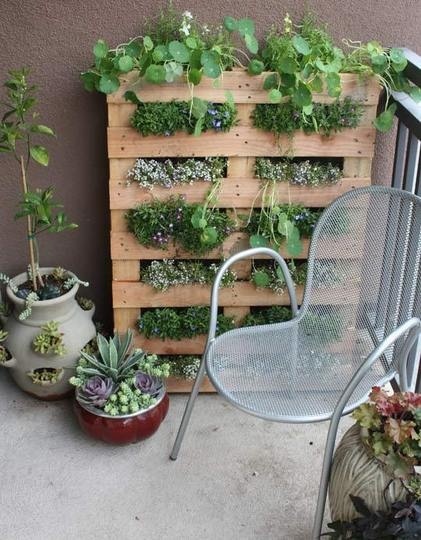 I'm a lover of the repurposed pallets too! But... having worked with them on events, I see all the odd nails that stick out randomly and it makes me worried to even bring them into my home! I had never heard of all those germs and fungi that were in them! Also, le sigh about that Paris link. Paris in B+W is really a beautiful thing. Maybe I'll dig up my 400+ photos of Paris and see if I have any gems to turn into B+Ws. And, one of the photos is of the Réaumur-Sébastopol metro, which is the metro that my apartment was next to. Pardon me while I go spend the rest of my day dreaming of Paris. I love the idea of palates, but aside from the scary chemical-and-bird-poop exposure that article mentioned, I'd be too worried about splinters! I fall in and out of bed constantly, stumbling to the bathroom in the middle of the night, and I'm sure I'd knick my shin and end up with more than a dozen splinters. 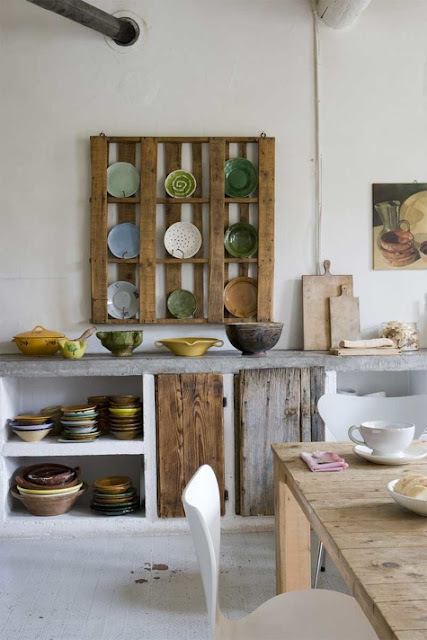 I like the planter idea and the kitchen wall-storage. But again, what about all those alleged germs and dirty stuff sitting so close to where you prep food?! Gah! I'm very neurotic, haha. 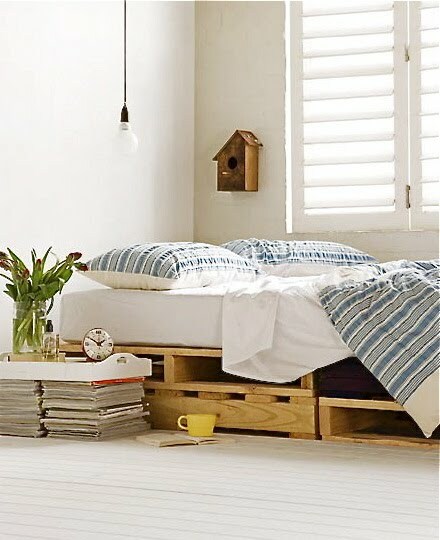 I've seen these pallet ideas before and I love them. They add the perfect amount of rustic. As a kid with a dad who owned his own manufacturing business, we always had pallets around. 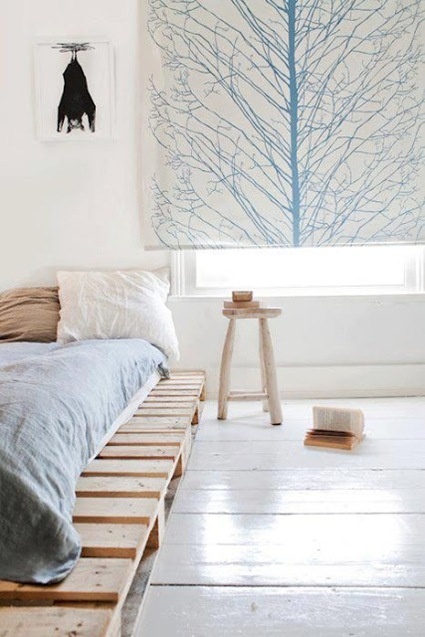 I used them in my tree forts but never thought of bringing them indoors. And now I want to make all my furniture out of pallets. I want to do in my house as a vertical garden that shows you. I love the pallets!!!!! 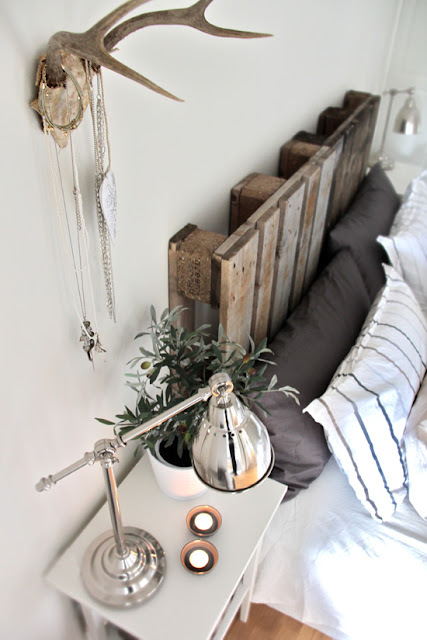 I’m still amazed that somebody once saw a discarded pallet and thought it would make a beautiful headboard! Now every time I see them behind my local grocery store or in the street I have to resist the urge to collect them! yes, i am glad i haven't been able to fit them in my car (or house) i am afraid i would have had a stack by now! Oh my! Germs! gross. Otherwise I think they're super super cool - would the germs go away with a bit of sand and varnish? I was just thinking that some of the ones you show above are rather clean. 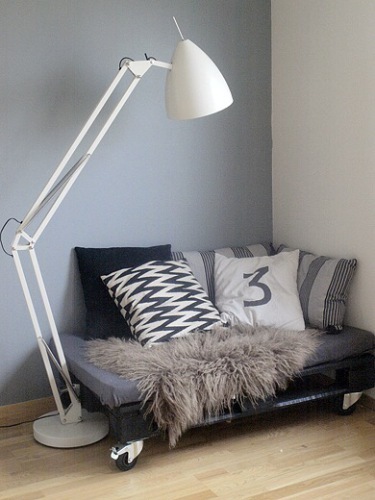 :) It's always fun and cool to see how people repurpose/upcycle items, and this idea is no exception. I love your roundup! I made some coffee tables out of free pallet wood and then sold them for good $'s! Next we want to make chairs out of them!! I really like the kitchen shelf. I've never seen that before. But I had NO idea about the possible 'dangers'!